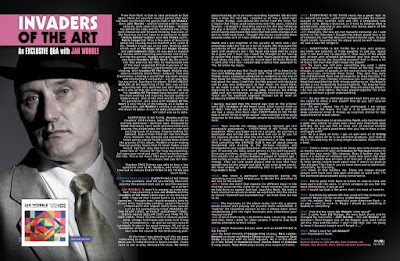 Discussions Magazine Music Blog: JAH WOBBLE: An EXCLUSIVE Q&A with the iconic British musician! 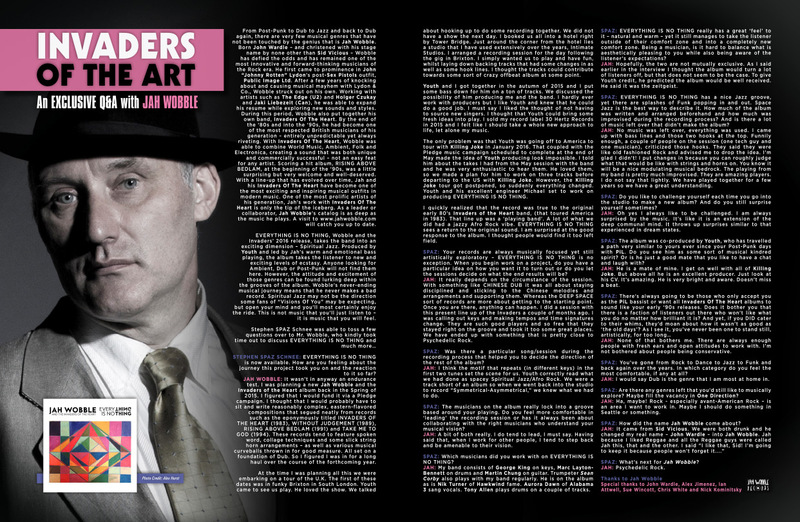 JAH WOBBLE: An EXCLUSIVE Q&A with the iconic British musician! STEPHEN SPAZ SCHNEE: EVERYTHING IS NO THING is now available. How are you feeling about the journey this project took you on and the reaction to it so far? 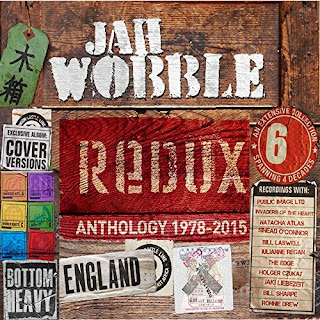 JAH WOBBLE: It wasn't in anyway an endurance test. I was planning a new Jah Wobble and the Invaders of the Heart album back in the Spring of 2015. I figured that I would fund it via a Pledge campaign. I thought that I would probably have to sit and write reasonably complex, eastern-flavored compositions that segued neatly from records such as the eponymously titled INVADERS OF THE HEART (1983), WITHOUT JUDGEMENT (1989), RISING ABOVE BEDLAM (1991) and TAKE ME TO GOD (1994). These records tend to feature spoken word, collage techniques and some slick string horn arrangements – as well as various musical curveballs thrown in for good measure. All set on a foundation of Dub. So I figured I was in for a long haul over the course of the forthcoming year. At the time I was planning all this we were embarking on a tour of the U.K. The first of these dates was in funky Brixton in South London. Youth came to see us play. He loved the show. We talked about hooking up to do some recording together. We did not have a show the next day. I booked us all into a hotel right by Tower Bridge. Just around the corner from the hotel lies a studio that I have used extensively over the years, Intimate Studios. I arranged a recording session for the day following the gig in Brixton. I simply wanted us to play and have fun, whilst laying down backing tracks that had some changes in as well as some hook lines. I thought the tracks could contribute towards some sort of crazy offbeat album at some point. Youth and I got together in the autumn of 2015 and I put some bass down for him on a ton of tracks. We discussed the possibility of him producing me and the band. I hardly ever work with producers but I like Youth and knew that he could do a good job. I must say I liked the thought of not having to source new singers. I thought that Youth could bring some fresh ideas into play. I sold my record label 30 Hertz Records in 2015 and I felt like I should take a whole new approach to life, let alone my music. The only problem was that Youth was going off to America to tour with Killing Joke in January 2016. That coupled with the Pledge music campaign scheduled to complete at the end of May made the idea of Youth producing look impossible. I told him about the takes I had from the May session with the band and he was very enthusiastic to hear them. He loved them, so we made a plan for him to work on three tracks before departing to the US with Killing Joke. However, the Killing Joke tour got postponed, so suddenly everything changed. Youth and his excellent engineer Michael set to work on producing EVERYTHING IS NO THING. I quickly realized that the record was true to the original early 80's Invaders of the Heart band, (that toured America in 1983). That line up was a 'playing band'. A lot of what we did had a jazzy Afro Rock vibe. EVERYTHING IS NO THING sees a return to the original sound. I am surprised at the good response to the album. I thought people would find it too left field. SPAZ: Your records are always musically focused yet still artistically exploratory – EVERYTHING IS NO THING is no exception. When you begin work on a project, do you have a particular idea on how you want it to turn out or do you let the sessions decide on what the end results will be? JAH: It really depends on the circumstance of the session. With something like CHINESE DUB it was all about staying disciplined and sticking to the Chinese melodies and arrangements and supporting them. Whereas the DEEP SPACE sort of records are more about getting to the starting point. Once you are there, anything can happen. I did a session with this present line up of the Invaders a couple of months ago. I was calling out keys and making tempos and time signatures change. They are such good players and so free that they stayed right on the groove and took it too some great places. We have ended up with something that is pretty close to Psychedelic Rock. SPAZ: Was there a particular song/session during the recording process that helped you to decide the direction of the rest of the album? JAH: I think the motif that repeats (in different keys) in the first two tunes set the scene for us. Youth correctly read what we had done as spacey Spiritual Jazz/Afro Rock. We were a track short of an album so when we went back into the studio to record “Symmetrical-Asymmetrical,” we knew what we had to do. SPAZ: The musicians on the album really lock into a groove based around your playing. Do you feel more comfortable in ‘leading’ the recording session or has it always been about collaborating with the right musicians who understand your musical vision? JAH: A bit of both really. I do tend to lead, I must say. Having said that, when I work for other people, I tend to step back and be amenable to their vision. SPAZ: Which musicians did you work with on EVERYTHING IS NO THING? JAH: My band consists of George King on keys, Marc Layton-Bennett on drums and Martin Chung on guitar. Trumpeter Sean Corby also plays with my band regularly. He is on the album as is Nik Turner of Hawkwind fame. Aurora Dawn of Alabama 3 sang vocals. Tony Allen plays drums on a couple of tracks. SPAZ: EVERYTHING IS NO THING really has a great ‘feel’ to it – natural and warm – yet it still manages to take the listener outside of their comfort zone and into a completely new comfort zone. Being a musician, is it hard to balance what is aesthetically pleasing to you while also being aware of the listener’s expectations? JAH: Hopefully, the two are not mutually exclusive. As I said earlier in the interview I thought the album would turn a lot of listeners off, but that does not seem to be the case. To give Youth credit, he predicted the album would be well received. He said it was the zeitgeist. SPAZ: EVERYTHING IS NO THING has a nice Jazz groove, yet there are splashes of Funk popping in and out. Space Jazz is the best way to describe it. How much of the album was written and arranged beforehand and how much was improvised during the recording process? And is there a lot of music left over that didn’t make the album? JAH: No music was left over, everything was used. I came up with bass lines and those two hooks at the top. Funnily enough, a couple of people on the session (one tech guy and one musician), criticized those hooks. They said they were like old fashioned Rock and advised me to drop the idea. I'm glad I didn't! I put changes in because you can roughly judge what that would be like with strings and horns on. You know it will be a nice modulating musical bedrock. The playing from my band is pretty much improvised. They are amazing players. I do not say that lightly. We have played together for a few years so we have a great understanding. SPAZ: Do you like to challenge yourself each time you go into the studio to make a new album? And do you still surprise yourself sometimes? JAH: Oh yes I always like to be challenged. I am always surprised by the music. It's like it is an extension of the deep communal mind. It throws up surprises similar to that experienced in dream states. SPAZ: The album was co-produced by Youth, who has travelled a path very similar to yours ever since your Post-Punk days with PiL. Do you see him as some sort of musical kindred spirit? Or is he just a good mate that you like to have a chat and laugh with? JAH: He is a mate of mine. I get on well with all of Killing Joke. But above all he is an excellent producer. Just look at his CV. It's amazing. He is very bright and aware. Doesn't miss a beat. 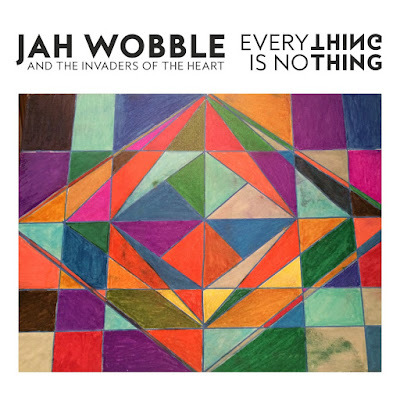 JAH: None of that bothers me. There are always enough people with fresh ears and open attitudes to work with. I'm not bothered about people being conservative. SPAZ: You’ve gone from Rock to Dance to Jazz to Funk and back again over the years. In which category do you feel the most comfortable, if any at all? JAH: I would say Dub is the genre that I am most at home in. SPAZ: Are there any genres left that you’d still like to musically explore? Maybe fill the vacancy in One Direction? JAH: Ha, maybe! Rock - especially avant-American Rock – is an area I want to work in. Maybe I should do something in Seattle or something. 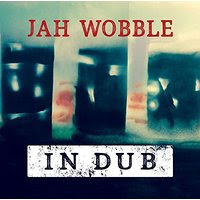 SPAZ: How did the name Jah Wobble come about? SPAZ: What’s next for Jah Wobble?